All returns and Grow Bags Depot are subject to a 20% restocking fee. The buyer is also responsible for return shipping costs and the original shipping charges are not refundable. We must be contacted before hand for return instructions and a RMA form. Without this form included in the package the return will be denied. No returns can be accepted 30 days after the purchase date. Once the return is processed the refund with be processed immediately but may take the bank 1-3 business day to show the credit in the account. Here at Grow Bags Depot we strive to get your order to you as quickly as possible. Our delivery times are typically around 3 business days. Many of our larger orders require freight shipments. If this is the case with your order please provide an accurate phone number so you may be easily contacted for the freight delivery. We always try to ship as discreetly as possible but we will not guarantee 100% discreet shipping. If 100% discreet shipping is required please contact us beforehand. Please inspect and count your order before signing for the package. Failure to do this may result in any claim of missing/damaged pots being denied. Thank you for shopping with us! When you've finished shopping and begin the checkout process, you will move into the secure area of our site. A warning window may pop up to notify you that you are entering this "safe" area. Once you've entered, the page address (URL) will change from http to https, to let you know you are in a secure area. Also, a key or a closed lock will appear in the lower left hand corner of your screen to notify you of this change. You will remain in this secure zone for the entire checkout process. In addition, you may consult the rules established by your browser to learn about other possible features that indicate that you are on a secure internet page. 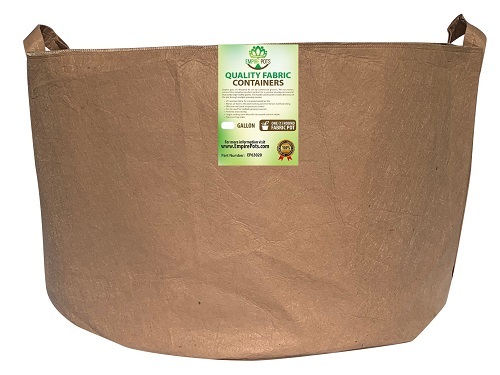 In the event that a Grow Bags Depot product is mistakenly listed at an incorrect price, Grow Bags Depot reserves the right to refuse or cancel any orders placed for product listed at the incorrect price. Grow Bags Depot reserves the right to refuse or cancel any such orders whether or not the order has been confirmed and your credit card charged. If your credit card has already been charged for the purchase and your order is cancelled, Grow Bags Depot shall issue a credit to your credit card account in the amount of the incorrect price. We will ship your product as it becomes available. Usually, products ship within 24 hours of placing an order or by the next business day if your order is received on Saturday, Sunday or any major holiday. However, there may be times when the product you have ordered is out-of-stock which will delay fulfilling your order. We will inform you as soon as we know that the item is unavailable. We will keep you informed of any products that you have ordered that are out-of-stock and unavailable for immediate shipment. You may cancel your order at any time prior to shipping.